Established on the notion that education is found not only in a book (or online), SHiFT, held in Alabama and Tennessee, gets people to unplug and immerse themselves in a collaborative learning environment—based on experiences. Its founders believe that these experiences, when coupled with the vast information at our fingertips, will create a new knowledge economy of design leaders, who will have the power to change the world for the better. “Shift was created for explorers, builders and leaders in order to reignite the playful nature of creativity and foster instinctive design thinking and practices,” says Owen Foster, IDSA, co-founder and co-director of SHiFT who also was named IDSA’s 2015 Educator of the Year. SHiFT Design Camp is a co-curricular experience for people to enhance their understanding of the world, recognize how they fit in and collaborate with others to impact our future. It all started at grad school in Auburn, AL. Foster and McCabe would take their design students camping when they began to realize that the world was changing. Students weren’t gathering experiences anymore. They were having a hard time turning data into knowledge. Having those firesides with the students sparked the passion that Foster and McCabe have for design education. While their careers are founded in traditional teaching practices, SHiFT allows them to give experiences to the students, paving the way for the next wave of design leadership. SHiFT is supported by the Eastman Innovation Lab (EIL), with the mission to help students understand why materials matter. "Too often, today’s students are designing with a limited knowledge of the materials with which their ideas will be manufactured," says EIL Creative Manager Farrell Calabrese, IDSA. "The more goods that are created abroad can create an even larger gap. The EIL sponsors SHiFT—not to promote Eastman materials—but to promote a way of thinking about making and balancing data with experiences, leading one to push the boundaries of what’s possible. Calabrese tells FastCoDesign her goal is to help designers apply the latest material research to the critical middle ground between ideation and execution. "There's only one semester of material education happening within the collegiate environment," she tells FastCoDesign's Diana Budd. "It's very little and it's very basic." SHiFT is a process of thought, designed to facilitate participants’ ability to gather data and then collaborate on a challenge, based on instinctive thinking. There are no right or wrong answers at SHiFT. Each day brings a new challenge. After the morning lecture series, teams break out to think through how to solve the problem. They gather supplies and get to work. By the end of the day, they present their solutions to the group. Every group takes a different path and can learn from each other. If they fail—they fail fast and iterate to come up with another solution. Traditional teaching practices are founded on the notion that there is one leader and everyone else follows. As an educator and mentor, Foster wants to turn that model on its head. “I want the next generation to be better than us,” he says. SHiFTers are quickly becoming a community of design leaders that can connect the dots using life experiences balanced with data gathering. Their mission: Learn from others. Teach others. Make something amazing together. 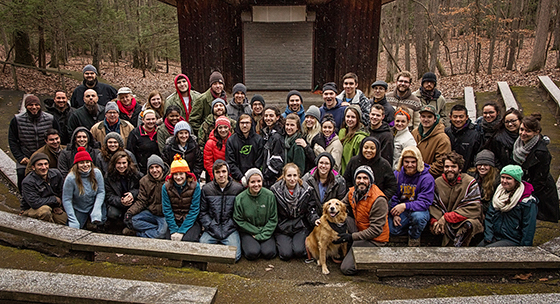 Follow @Eastman_EIL and @shiftdesigncamp on Twitter. EIL is powered by Eastman Chemical Company, an IDSA Ambassador.